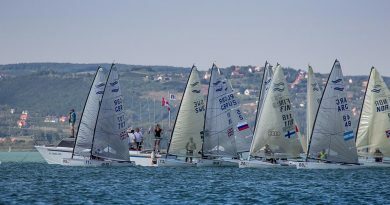 Many sailors at the 2017 Finn Gold Cup are making new friends, meeting old friends, and telling stories of times past. There are plenty of connections linking the past and the present. 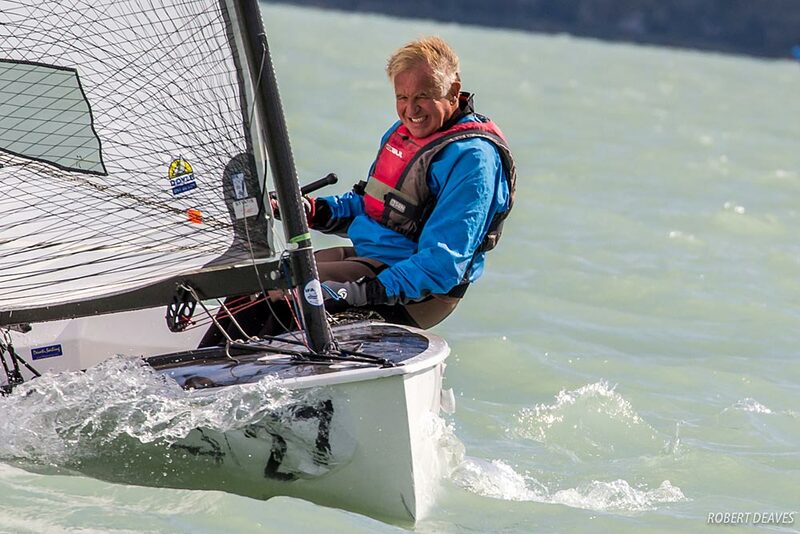 Many of them involve the International Finn Association’s President of Honour, Gerardo Seeliger, from Spain, who is not only sailing his first Finn Gold Cup for 41 years, but also celebrating his 70th birthday this Thursday. He is one of the oldest sailors here and recently relaunched his Finn career. 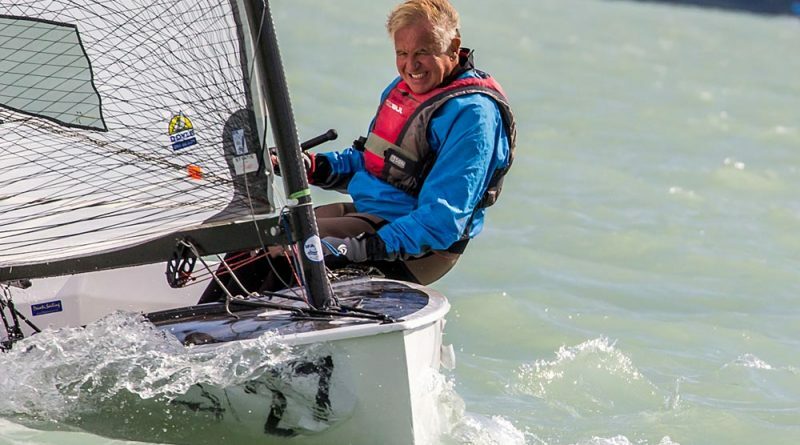 He has been reenergised by the prospect of sailing the 2018 Finn World Masters in El Balis, near Barcelona, where he will officially qualify as a Finn Legend. This event is part of his training for next year. He is currently placed 102nd. On his first day here he bumped into Rockal Evans, from Bermuda, who is sailing his first Finn Gold Cup. He is one of the recipients of funding from the Finn Class development programme, FIDeS. He was attracted to the Finn to follow in his grandfather’s footsteps, who sailed the Finn at the 1976 Olympics. 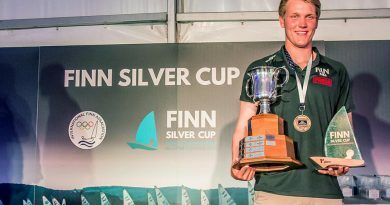 Seeliger’s first Finn Gold Cup was 1969 in Bermuda. It didn’t take long to realise that he had sailed against Evans’ Grandfather, Howard Lee, at that event. Lee later sailed at the 1976 Olympics while Seeliger went on to compete at the 1972 Olympics. He tried to qualify again in 1976, but was up against a very strong Spanish team and stopped sailing the Finn soon after, but remained a part of the class and was IFA President from 1981 to 1997. For the past 20 years he has been the IFA President of Honour. Seeliger’s predecessor as IFA President was the former IOC President, Dr Jacques Rogge, and his successor was his son, Philippe Rogge, who also turned up at Balaton this week to meet old friends, and has threatened to be back on the race course before too long. In 1970 Seeliger was sailing the European Championships in Dún Laoghaire, Dublin, Ireland. In the latter part of the week it became very windy with winds from force 4-7. It was in the days of one long race a day, and because of fog on the Tuesday there were two races scheduled on Thursday, the second of which should not have been held. 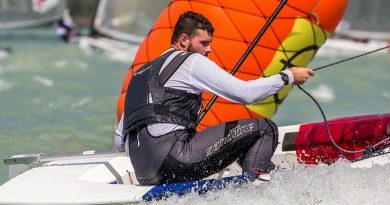 Two competitors were discovered floating away from their craft, including Seeliger. He had no lifejacket and was wearing several sweaters, common at the time for increasing weight. Then he felt a pair of hands trying to pull him out of the water. Hungarian Finn sailor, György Fináczy, had seen Seeliger’s overturned hull and started looking around until he finally found his fellow Finn sailor. Fináczy abandoned his race to save Seeliger. Somehow he got the soaking Spaniard into his boat and transferred him to a motorboat to go back to shore and to hospital for checks. Needless to say, Seeliger sailed the next day with no ill effects. When Seeliger went home to Spain he went to the Olympic Committee and asked them to give Fináczy a medal for good sportsmanship and for saving his life. Fináczy was invited to Spain to receive the medal, but could not leave the Communist Hungary at the time, unless it was for an international sailing competition. He could only come at Christmas, so the Palamos Chistmas Race came into existence, created solely for Fináczy to be able to travel to Spain. That first year there were two competitors: Seeliger and Fináczy in their Finns. Seeliger recalls that Fináczy won. The following year there were five Finns and from there the event took off to become the world famous race that it is today. Earlier this week György Fináczy and Gerardo Seeliger met again, for the first time in 30 years – old Finn friends with an unbreakable bond. So the Finn Class wishes a happy 70th Birthday to Gerardo Seeliger. Once a Finn sailor, always a Finn sailor.